2 Feet Out The Door: New Stuff Just for You! I mentioned in the last post that we are back in Laos. We've also mentioned before that we have a store. Laos has some pretty cool stuff that we would like to share with you. Thing is, as we are traveling, we can't buy a ton of this cool stuff and wait for orders. Fortunately, we will be in Vientiane for about a week more, which is plenty of time for you to tell us what you want. Let me give you an idea of the possibilities. Silver. Silver is abundant here, and beautiful jewelry and other lovely handcrafted things can be found. Traditional Lao dress: Skirt (or sinh) with matching shoulder sash. Clothing. Not just any clothing, though we can get that too. We can get you "fisherman pants," which are unisex, one size fits all, and tie to close. There are also what I call "hippie pants" but I guess they're close to harem pants. They usually have an elastic waist (or cute ruched ones for the ladies) and elastic ankles, so you can leave them down, or pull them up to your knees to make shorts. The fabric is very light and airy, and they are extremely comfortable. 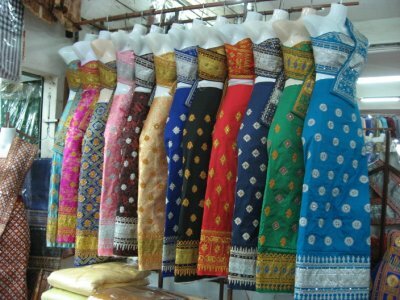 Another option for clothes are traditional Lao skirts for the ladies. They are gorgeous and come in different colors and patterns. They usually come to mid-calf, and pair nicely with high heels and a nice shirt, or with a tank and flip-flops. So think about it. If you are a coffee drinker, let us know and we can hook you up. Need a gift for your lady-friend? Silver earrings! Let us know what you are interested in, and we will send you pictures and prices. Seriously, don't miss out on this cool stuff. Comment here, or email us, or tweet us, or whatever else you want to do to get a hold of us. We're all ears!